Good afternoon all. I’ve now added a second podcast to my collection on audioboo.fm. The lessons of last week have been learned and this one is most certainly under 5 minutes long. However, I’m still not totally satisfied as I don’t think the audio quality is as good this time. Still, there’s always next week. From here on, I don’t intend putting up a post every Friday. So, I’ve added a new box to the right-hand menu which provides a link to the latest podcast. Who's the boss in French politics? 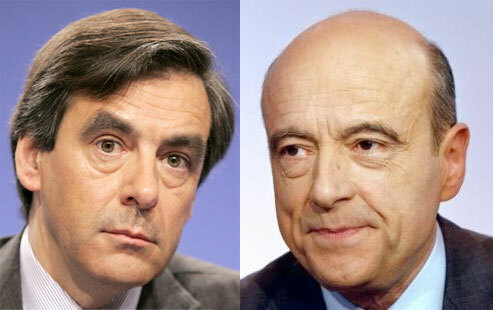 François Fillon or Alain Juppé. Here are the answers for the questions posted yesterday. As I explained, some questions had several answers before we got to the right one. In one case, alas, the correct answer was never found, leaving those of us who had submitted it at a disadvantage. The second question of the night was: “Who is the Prime Minister of France?”. This was quite a hard one for so early in the quiz, I thought. Well, it turned out to be a mistake as the answer given was Nikolas Sarkozy. I doubt I need to tell you that M. Sarkozy is the President of France and, as a matter of fact, has never served as Prime Minister. The disagreement expressed by the contestants led the quiz master into a hasty retreat. Literally – he walked back to the correcting table! After a brief discussion he came back to the mic and announced that the answer was actually Alain Juppé and the three teams in the room who’d answered thus would be getting a point. This surprised Ger on our team who, after much mental effort during the round, had come up with the name François Fillon. However, he wasn’t 100% sure about it and, presuming that the correct answer had actually been frantically looked up, let it pass. The following morning he went to the trouble of finding out and, sure enough, M. Fillon is the Prime Minister of France. Alain Juppé was Prime Minister once – between 1995 and 1997! That said, he is the current Minister of Foreign Affairs. Perhaps, not having the ability to look up the answer, the correctors simply totted up which one (other than Sarkozy!) was given by most teams and presumed that was right? I hope everyone had a pleasant Easter. As I stated last week, there will be no weekly quiz at Gilligan’s tonight. However, that’s not to say that I don’t have any tales to tell. 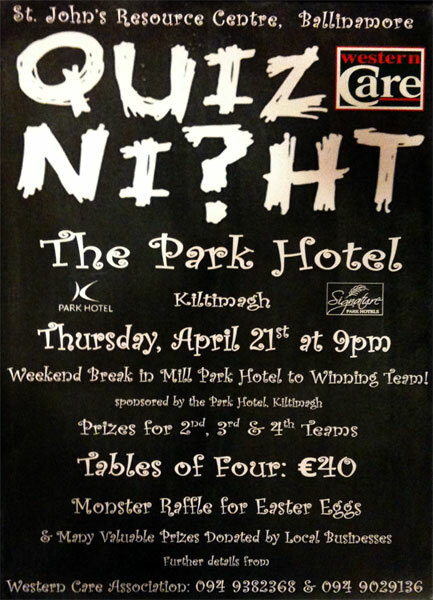 Last Thursday night, myself, Ger, his good lady Breda and Gilligan’s regular Mick took part in a quiz for the Western Care Association in the Park Hotel, Kiltimagh. 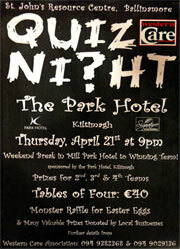 A quiz for a good cause and a quiz which didn’t threaten marital harmony. You see, Ger and Breda have a running debate/argument about whether one should always give back prize money won at a charity quiz. Breda says yes, Ger says no. Call us what you like but I agree with Ger. You’ve already contributed to the charity with your entrance fee and (almost certainly) tickets for the raffle. That’s what the quiz is for – it’s a vehicle to get people to make those particular donations. Of course, certain winning teams, either through knowing the organisers, supporting what the charity does or just because they have a generous nature, choose to redonate their winnings. That’s fine. Indeed, it’s admirable. But it’s still their choice. 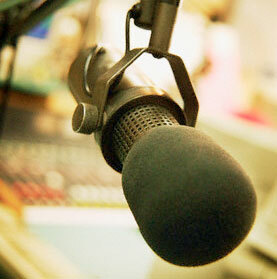 I host a show on Claremorris Community Radio every Friday morning. It’s the Good Morning Show*, and sounds exactly you’d expect a show with that name to sound: music, diversions, you-text-in-and-I-read-it-out etc. Update: due to my own silliness, the end of the clip has been cut off. Click on the Continue link to see the answers. Below you can find the answers to post sets of questions posted yesterday in The dreaded countback. No-one likes being defeated in a playoff but losing by countback is even worse. For me, it makes those post mortem discussions about the ones you got wrong in the regular quiz all the worse. You’ve seen the 14 questions we got wrong. If we’d managed to get just a single one of them right, we’d have avoided the playoff and won by a point. Once upon a time, I was on a team that lost out on €5,000 on countback. That was even more cruel as (a) the organisers didn’t even bother with any form of tie-breaker that night and (b) we tied with the other team on the same amount of 10s so it went down to who had the most 9s! I’ll tell you all about it someday. The scores were very close at last night’s quiz in Gilligan’s, Claremorris. My team, The Pub Spies, led at half-time by two points but, alas, had a bit of a ‘mare after the break. To cut a long story short, we ended up tied in the lead on 95/110 with, funnily enough, the team whose answer sheets we’d been correcting all night, Eurovision. So, a playoff was announced. Which team are the current Heineken Cup champions? Which two European capital cities are closest to one another? Claremorris native Lucinda Creighton is the Minister of State for what portfolio? In journalistic short-hand, what does the term “manne” signify? Stone the crows, but both teams ended up on 2/5. Due to the fact that it was getting late, and that there weren’t any more questions, it was then decided that our scores from the main part of the quiz would be examined to see who got the most 10s. Unfortunately, ‘they’ did, and we were defeated by 4-3. I suppose it was fitting that a team named after the event that first introduced me to the term ‘countback’ should end up winning. 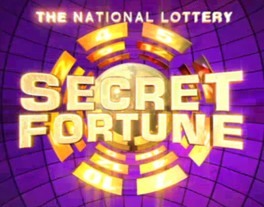 Secret Fortune is a BBC/National Lottery game show that is broadcast on BBC One, on Saturday evenings. 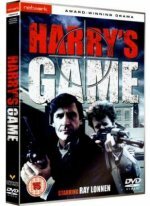 Donegal native Paddy Duffy is a writer, working on the second series of the show. I’ve written previously about my dream to someday invent the next Who Wants to be a Millionaire (and thus make my fortune). With this long-standing ambition in place, you’ll guess how excited I was to find out that Paddy Duffy, an old friend and fellow alumnus of the NUI Galway Quiz Society, is currently a question writer on UK quiz show Secret Fortune. I had a little chat with Paddy last week and asked him to tell us all about it. I admitted to Paddy that I hadn’t been too aware of Secret Fortune. I tend to change channel whenever I hear that a program related to the lottery (any of them) is coming on next. How does it work? Here are the answers to the questions posed yesterday in The difference maker. Our team ended up on 95/102. Why such an unusual total? Well, one of the rounds came to an abrupt halt after only seven questions. However, it did include the question about the Roman Emperors (see below) and we were told that we’d get a point for each one. There was also another question which had two parts and each of these was awarded a point also. Thus, the round with seven questions became a 12 pointer. Afterwards, I asked the quiz master what happened. “I had all the questions typed up on the computer and I printed them out just before I set off for the pub” he told me.